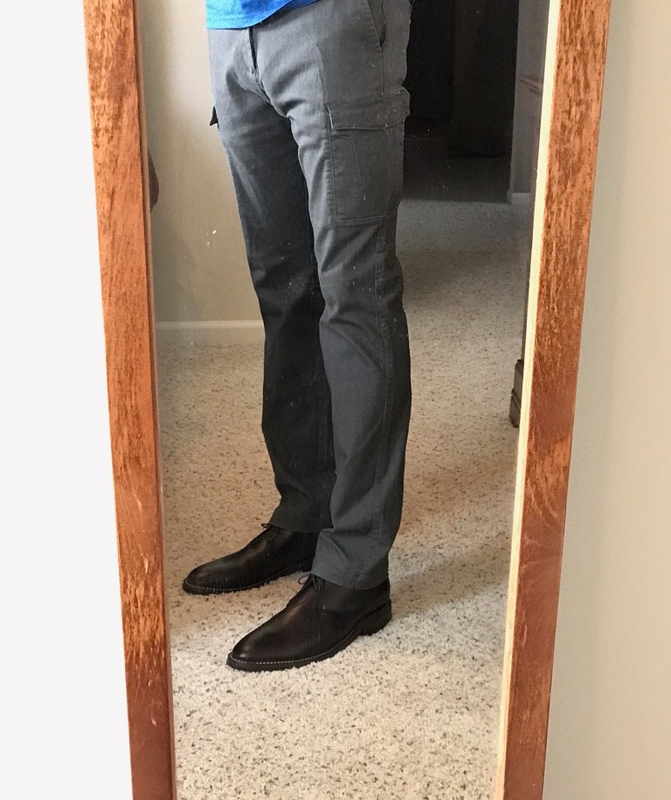 I tried on a couple button downs, and didn’t fall in love with the fit of them. I would need them tailored, which would cost more than the price of the shirt. But I would still recommend checking them out, because the look/style of them were pretty solid. 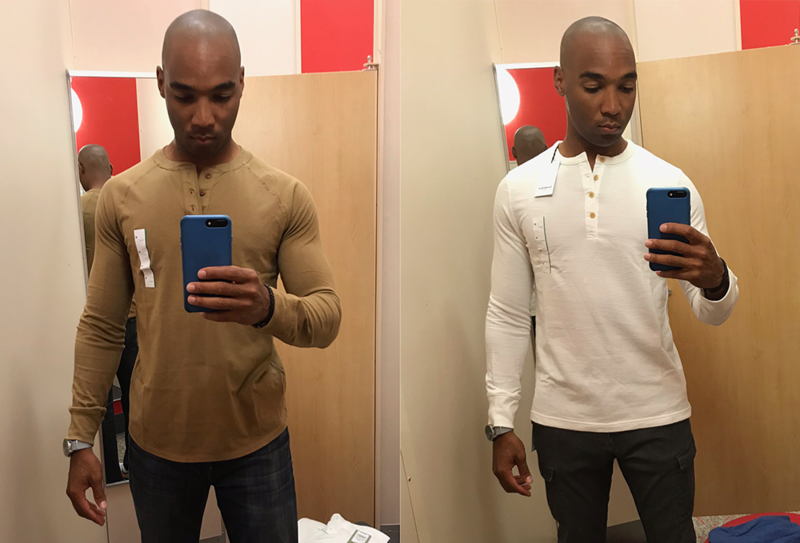 The henley is pretty much the best all around shirt you can have in your closet, and a favorite of mine. So naturally I had to try on a couple of these. I liked the style of both of the options I tried one, but one of them missed the mark on fit for me. The other was added to my shopping cart. I will absolutely be buying more henley’s from there. You read that correctly. I decided it was time to re-evaluate cargo pants. But not the huge baggy ones that were once popular. I’m talking the modern slim cut variety. And I can’t believe how much I liked them. The stretch material made them very comfortable and flexible. Needless to say, they came home with me and are now a part of my wardrobe. I didn’t spend much time with the blazer, but I did a quick try on just to get a sense of the fit. I wasn’t impressed, but I’m also a bit more picky about my blazer choices. I didn’t get the vibe that it was something that I would want to dress up with a tie. It was much more of a casual blazer, which is fine if that’s what you’re into. But it missed the mark for me. Going into fall, long sleeve tees are essential. And the one I tried from Goodfellow & Co. was great. While it didn’t make it to my shopping cart (yet), I can certainly recommend it. 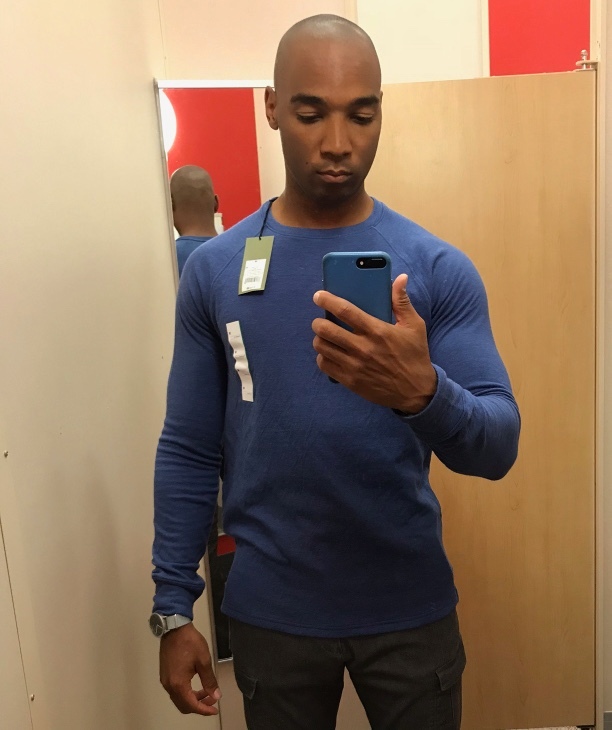 Super soft to the touch, good fit, and their color selection was very good. While I didn’t try them on, they had some great looking sweatshirts and hoodies that were very cozy feeling. They had a great selection of tees; both v-necks and crew necks, a wide color selection, as well as stripes and patterns. Assuming the fit is good, this brand could meet all your t-shirt needs. As much as I like some of the items that I tried on and bought, I’m not expecting these items to last in the long term. If they do, then it’s a bonus, but at these price points and in mass production like Target has, it doesn’t scream long lasting quality. And that’s ok. So if/when you buy some Goodfellow & Co. items, just enjoy wearing them now and keep your expectations low on the longevity of them. I Recommend Goodfellow & Co. In case it isn’t obvious, I strongly recommend this brand. It helps that Target stores are very accessible stores (at least here in the US). But I was pretty impressed with the GoodFellow & Co. line. I didn’t get around to trying on any sweaters or denim, but I will most certainly be heading back there in the fall. If you can’t make it to a store, you can buy it online as well. But at these price points, I would strongly suggest trying items on before deciding to buy.